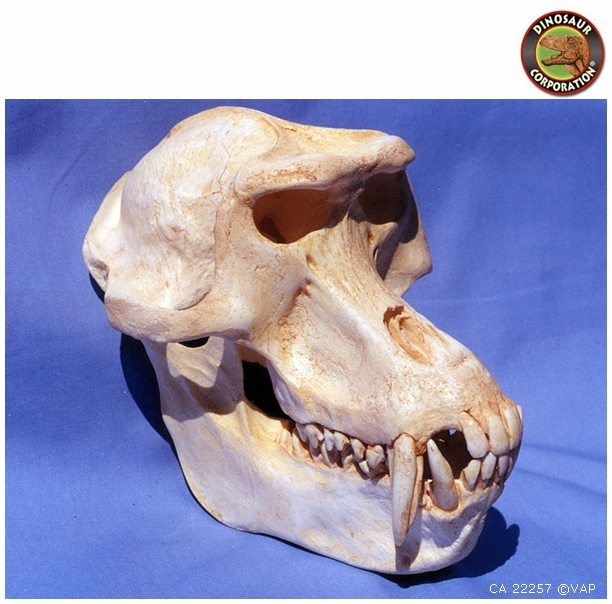 Gelada Baboon Skull. Theropithecus gelada. Sub-adult. Grazers of the mountains of central Ethiopia. Rocky gorges and precipes. California Academy of Sciences Specimen. Gelada (Theropithecus gelada), sometimes called the Gelada Baboon and Bleeding-Heart Baboon, is a species of Old World Monkey found only in the Ethiopian Highlands, with large populations in the Semien Mountains. Gelada Baboon males average 18.5 kg (40.8 lb) while females are smaller, averaging 11 kg (24.3 lb). The head and body length of this species is 50�75 cm (19.7�29.5 in) for both sexes. Tail length is 30�50 cm (11.8�19.7 in).